There was once a large pond where this new path now runs through the Oriental Garden. 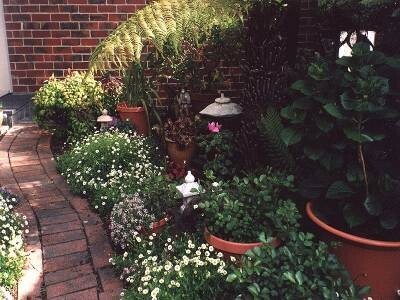 Having two small grandchildren made us reconsider some aspects of our garden from the point of view of safety. The back garden was very secure as far as fencing and gates went but the pond was a worry. Removing it turned out to be a blessing as the new path gives better access to the rear Patio, flower gardens and clothes line. How often it seems that the things feel we have to do in the garden turn out to be the things we should have done anyway. 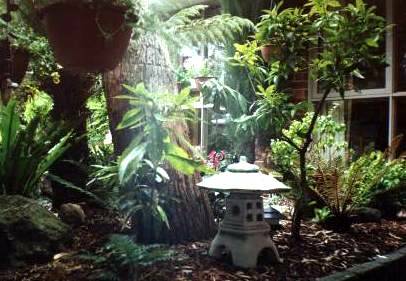 When the tiny pagoda garden lights come on at night, the grandkids sit by the windows of the rumpus room and watch for the fairies they have been assured reside among the ferns, oriental garden ornaments, potplants and tubs.